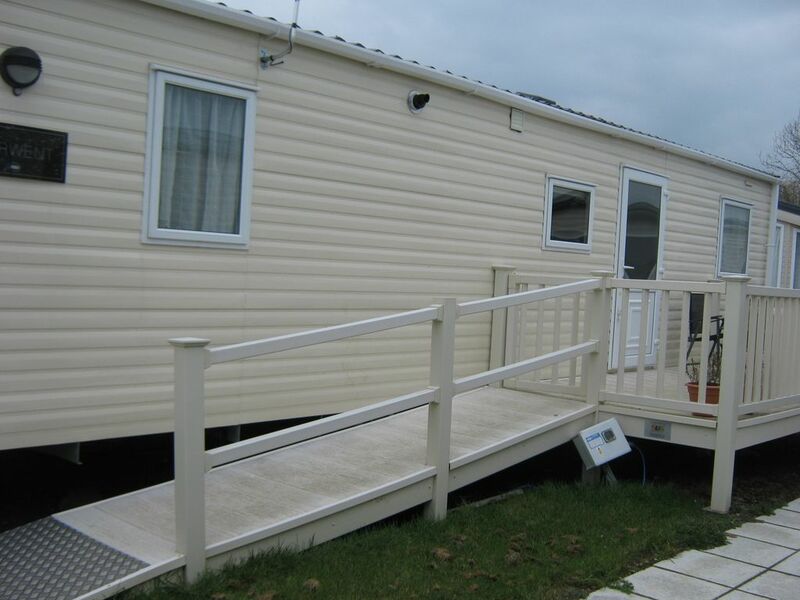 This holiday home on Hayling Island is accessed by a wheelchair ramp. It has a wheel-in wet room with wheeled shower chair, electric bed and electric hoist, plus folding wheelchair for transfers to and from the swimming pools. The pool complex also has a hoist to help wheelchair users in and out of the water. The kitchen is designed for access from a wheelchair with low units and space under the sink. Wide internal doorways and ample room for moving around inside the holiday home. A threshold bridging ramp is stored just inside the front door. Central heating and double glazing throughout. 2 twin rooms and sofa bed in lounge. Although pets are not generally allowed, we do permit assistance dogs as the holiday home is for disabled people. Wheel-in wet room with toilet with grab rails, power shower with wheeled and fixed shower chairs available, wash basin with mirrored cupboard above. The mobile home is fully double glazed with gas central heating. There is a launderette next to the club house. There is hard standing adjacent to the mobile home with space for a tail ramp or lift. By reversing in to park as close as possible to the mobile home the ramp/lift should lower onto the paved area. Free internet is available in the bar and restaurant building. There is a gym adjacent to the swimming pools. Spacious living room with ample area for manoeuvring a wheelchair. There may be some store cupboard foods - please replace if you use them up. Adequate crockery, cutlery and glasses for 8 people. There is a dining table inside with 4 dining chairs and also a patio table and 4 chairs. There is a stereo radio/CD layer in bedroom 1. The TV has a built-in DVD player. There is a small selection of books, authored by the owner. The games room is adjacent to the indoor pool. A selection of CDs is on the dressing table in bedroom 1. There is decking outside the mobile home with patio furniture. Fully wheelchair accessible with ramped entry, low kitchen units, wheel-in wet room, electric hoist (please bring your own slings) and wheeled shower chair. There are indoor and outdoor pools onsite. There is a hot tub inside the indoor pool building. There is a restaurant with Costa Coffee, a bar and live entertainment every evening. To access the bar, pools, gym and entertainment it is necessary for each holiday maker to purchase a £10 ID card for the week or part of a week. Had another great time here with Joe. The caravan is comfortable. Will be back again soon I hope. Hi Sam, I'm glad you had a great stay. You're welcome back any time. Stayed just 3 nights here with my partner and my son and wish it was for longer. Has everything I needed to care for my boy, very comfortable beds and in a very good location. Would highly recommend staying here. We're so glad it met your needs. You left it in immaculate condition and would be very welcome to come again any time. I'm glad you had a good stay, you left it in immaculate condition and would be very welcome to come again. We will think about a bigger TV when funds allow! Some of my family and myself stayed here for only 2 nights, as we were on Hayling Island to attend a family celebration with my son who lives there. We found the caravan very clean, and in a very accessible location on the park. It is very spacious, and the beds are so comfortable - we all had a good nights sleep. I particularly liked the wet room shower which was ideal for me as I have a mobility problem. I would definitely recommend this caravan. Thank you for your kind comments. I'm glad you had a good stay with us, and look forward to welcoming you again. Lovely clean and spacious accommodation in a great location! I would definitely recommend the accommodation. The caravan was very clean and presentable and very spacious. Very close to all amenities. Over all a great place to stay! Caravan was very comfortable and lovely and clean, everything you needed as far as utensils and crockery were concerned. Owner very helpful at all times. Good site with pool, kids entertainment and activities and not far from beach. Excellent location and base for exploring this beautiful and historic part of the country. Would definitely recommend and stay again on my return to the area. Thank you! We're glad you had such a great stay and look forward to welcoming you again. No pets; however, as the caravan is fully accessible for wheelchair users, assistance dogs are permitted at no extra cost. No cleaning fee will be charged provided that the caravan is left clean and ready for the next holiday maker, but if not we reserve the right to add a cleaning fee of £50.